I’ve felt the heavens shift today. I think I’m going to be ok. I’ve painted my blues away. When the going gets tough, I fake it and keep going. What else can I do? Pout, stay in bed, cry, give up? I did none of those. I kept my daily schedule. I ate lots of chocolate chip cookies and some ice cream. I said no to exercise classes and swimming. I didn’t shower yesterday. I haven’t yet today. I don’t smell, not sweating much. It’s winter. I read. I painted and painted on my little index cards with watercolours. I’m working ahead on my 365 Somethings 2018 project. That’s what I do with my excessive energy. Now I’m feeling almost like an artist. I am an artist! Suprisingly, I don’t feel any fatter. Not any slimmer either. I guess I have Sheba to thank. She still dragged me out for walks, like it or not. When I look around the house, it is not any messier than its usual state. Astounding! I must be doing something right, sticking to my good habits. They have stuck with me through thick and thin. I’m ecstatic. I’m in heaven. I could dance without music. 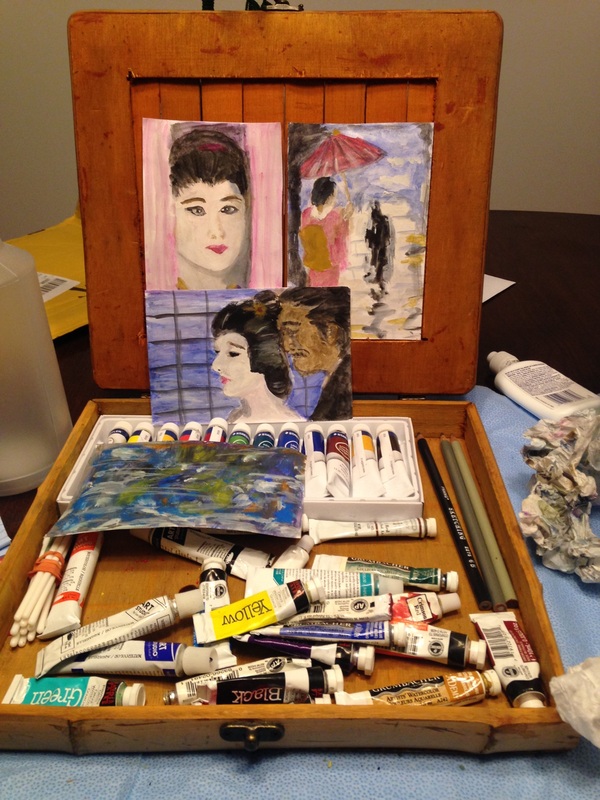 This entry was posted in Uncategorized and tagged artist, faking it, habits, I'm in heaven, index card art, kept going, life, painting, thick and thin, watercolours, writing. Bookmark the permalink. I’m glad you got to do some things you enjoy and eat what you pleased. I only got to read for half an hour. I still haven’t gotten around to finishing a long overdue post I’m trying to write. It will be a long night. I’ve stalled too long on this and another, and although I’ve been sick for two days, I think I’m about normal again. Wish my list of things I have to do that I won’t want to do (sales tax form, etc) weren’t so long. Yes, I would say you’re doing several things right….glad you had a good day! Thank you, Terry! I could see some chocolate chip cookies now. 🙂 I had to lock Sheba up with the guy. Barking up a storm. Grr.